Ever notice that after shooting your Ruger Mark II and Mark III pistol for an extended period of time that your thumb is hurting from pressing down the bolt release? Or maybe you're just having trouble activating the bolt release because of some custom grips you've installed. The Volquartsen Extended Bolt Release will cure both problems by replacing the factory bolt release. 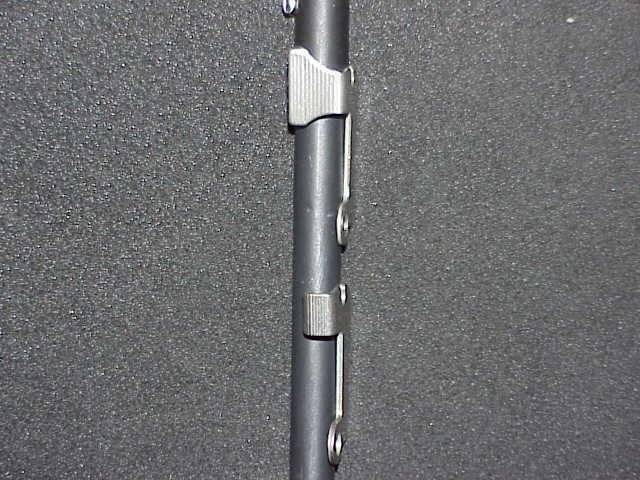 The picture shows the Volquartsen Extended Bolt Release (top) in satin nickel and a factory bolt release (bottom) . Notice the increased surface area for your thumb with the extended bolt release. With the extended bolt release you'll be able to more easily reach the bolt release and apply more leverage to the bolt release making releasing the bolt easy and fast. It's great for people who, because of reduced hand/thumb strength, may have trouble activating the factory bolt release. Once installed , you'll wonder how you ever got along without it! Available in Satin Nickel or Black finish. This is a must buy even if you don't get the Volquarsten Ruger Mark II Volthane Grips. It is so much nicer on the fingers. Although I highly recommend you get the grips too! ENJOY! Nice product, works well with the Volquartsen Mark II Volthane Grips. Excellent product regardless of grips. No gunsmithing required!